Events are piling up so quick and fast these days that we run the risk of not fully appreciating our achievements. Before we fix our eyes firmly on next weekend’s Derby & Dressage Show, let’s look briefly back to last Sunday’s Northwest Challenge at Eglinton. Yes, we won the Dressage Challenge and, yes, we did brilliantly to get two teams into the jump-off for the Show Jumping Challenge, even if we ultimately had to settle for blue and yellow rosettes instead of red ones and a shiny silver cup. But our greatest victory was surely our overall effort as a club which ensured that we pulled our weight in the organisation and running of this collaborative event and also sent out a record number of participating teams. A lot of members contributed in different ways to make it such a success and, even at risk of missing somebody, it’s worth naming a few. Thanks to Seamus for providing such a challenging yet fair course with so many obstacles in such a tight arena, and for being there both on Saturday evening and from first thing Sunday morning to ensure that each and every detail was just right for the big day. Thanks to Audrey for arriving before any of us, manhandling the dressage arena and making sure that everything was in place in time for the competition to begin punctually. Although that effort alone would have been enough for many a member, Audrey then spent the entire day scribing with Jackie, patiently and with good humour sitting through the relentless torture of the neighbouring drivers who stuck to their sport as doggedly as we stuck to ours. Thanks to Francis and Vera who did such an expert job of selecting our teams and delivering success on the big day. Their task was a difficult one as they rose to the challenge of accommodating all our members on sporting teams. This would have been impossible had they had to contend with egos and personalities. It’s a credit to each and every member that they were willing to trust the chefs d’equipe entirely, allowing them to put the club first in their careful strategic plotting. Thanks to Vera and Louise for grappling with the dressage scores and strong-arming the calculator as well as their brains until each and every result was triple and quadruple checked for accuracy. Thanks to Marina and her troops for their very able assistance in the show jumping judge’s box. Thanks to Damien and Nadine, Enda and Marina, Liz, Hazel, Vera, Hannah and Libby for making their horses available for the general effort. Without them we could never have built the number of teams that we needed. Thanks to everybody for making the effort to ride on the day, in particular to Enda who thought he wouldn’t be able to get there on time and to Leo who thought he wouldn’t be able to get away on time. Had Leo opted to take the easy route to his holidays, a certain number of privileged spectators would have been denied the experience of the world’s funniest dressage test as Mona did her utmost to sabotage Letterkenny’s chances of success. Thanks to Keary for so expertly building up the drama for his team. He could never have pulled it off so brilliantly, if he had tried. Thanks to Cormac and Anne for having the courage to take on the jump-off course on behalf of their teams. Both rode great rounds and were a credit to the club. We can’t always be the winners. Thanks to Maura for keeping the team scores on the day. Without her, this team challenge would be devoid of excitement, anticipation and atmosphere. She did a brilliant job and is patently irreplaceable for this particular position. Long years spent watching the Aga Khan Trophy at the RDS have paid rich dividends. And finally, thanks to Armstrong. Thanks to the horse who has jumped for Letterkenny at every Northwest Team Challenge, twice landing the coveted trophy for his team and never failing to get his team into one of the top three spots. This time, not for the first time, he brought two teams with him onto the podium. Nobody could wish for a greater club asset and we are very, very grateful to have him. Pictured below: The little horse himself, this time in action with Sharon. 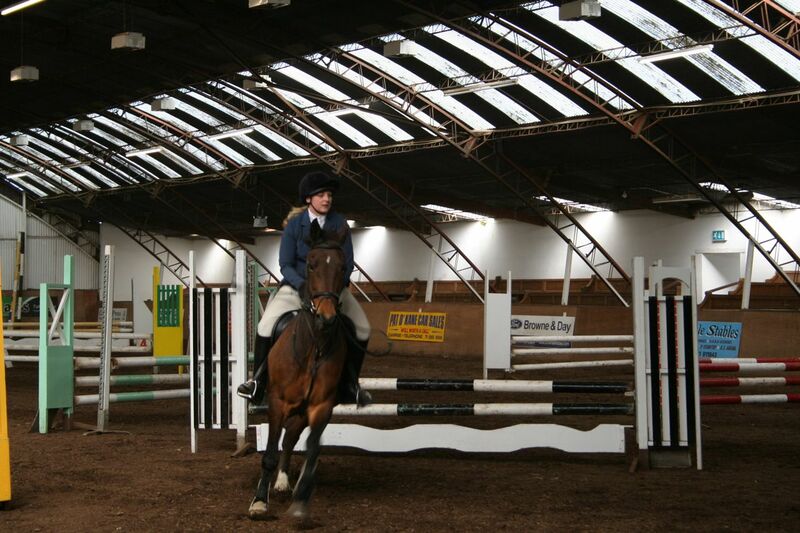 This entry was posted in All Competition News, Donegal Clubs Collaboration, Dressage, Show Jumping, The Horses, The People. Bookmark the permalink.